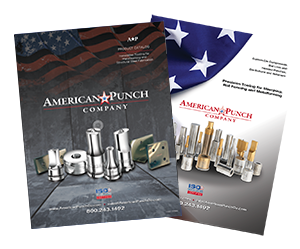 American Punch Company manufactures the most trusted punches and dies used in the steel fabrication industry. Our durable punch die sets provide the repeatability and dependability your operation demands. Scroll down to view the stock round, oblong and square punches we inventory and then call 800.243.1492 now to speak with a knowledgeable sale representative 800.243.1492 or submit this simple form.